You Have Been Murdered and Other Stories is a collection of weird, speculative fiction containing four stories dealing with the end of the world, both in terms of the death of the individual soul and the running down of the universe as a whole. The title story presents a woman who’s been murdered and still has a dinner party to prepare for. In “Teller of Tales,” a young girl must take on the responsibility of being the necessary conscience of her city. “Breach of Contract” describes the plight of an oil man who just wants to insure production quotas, but is roped into saving the world. Lastly, “The Trouble-Men” details what happens when a man trying to survive the end of the world meets up with those who are ending it. Andrew Kozma’s fiction has been published in Drabblecast, Albedo One, Fantasy Scroll, and Daily Science Fiction. His book of poems, City of Regret (Zone 3 Press, 2007), won the Zone 3 First Book Award. His previous collection of short fiction is The Year of the Stolen Bicycle Tire and Other Stories. This was an enjoyable short story collection. I wanted to read more, and this was just a tease of the imaginative writing that I can expect in the future from this author. I would recommend this to people who enjoy creative visions of our reality. Below are my thoughts on each short story. 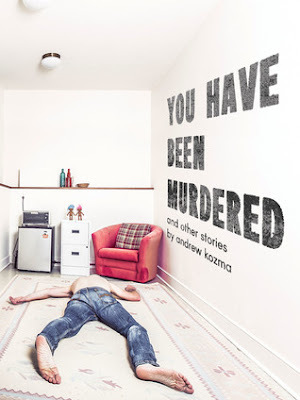 You Have Been Murdered- This story gave me the unsettled feeling that the Murdered young women must have also been feeling. I enjoyed reading through her attempts to hide her death, and the anxiety that persisted even though she was dead. Teller of Tales- This story was great because the author did a good job of building anticipation. I was excited to learn what happened next and disturbed by the ending. As a fan of many dystopian novels, this was right up my alley. Breach of Contract- I like the absurdness of the story, met with the rational mind of the oil man. I also liked that it included a Native American character, because diversity always elevates a story for me. The Trouble Men- These men were scary because of their described lore and appearance. I could relate to the man's fear, and his resignation to his fate.The end of the world could happen in so many ways. Why not this one? "They knew all your secrets, even the ones you had forgotten, but they would never tell them to anyone and, now, neither would you." Andrew Kozma's fiction has been published in Albedo One, The Cupboard, Fantasy Scroll and Daily Science Fiction. 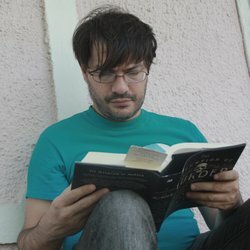 His poems have appeared in Blackbird, Subtropics, Copper Nickel, and Best American Poetry 2015, and his book of poems, City of Regret (Zone 3 Press, 2007), won the Zone 3 First Book Award. He has been the recipient of a Jentel Residency, a Houston Arts Alliance Fellowship, a Walter E. Dakin Fellowship, and a D. H. Lawrence Fellowship. He lives and writes in Houston, Texas.